Located at the corner of S. State Rd. 7 and SW 20th St., Extra Space Storage serves Fort Lauderdale residents near Broadview Park, South Fort Lauderdale, and Plantation. Locals will recognize our facility next to Shell across from Vila's Restaurant & Lounge and Chevron. We're also accessible for residents of nearby apartments, such as Fairfield Park Apartments and New River Cove Apartments. Extra Space Storage is about 3.7 miles from Nova Southeastern University, giving college students a great option for secure storage during summer breaks, while studying abroad, or while traveling for internships. With a variety of storage units, climate-controlled storage, vehicle storage, and exceptional security, Extra Space Storage on S. State Rd. 7 has everything you want in a storage solution! 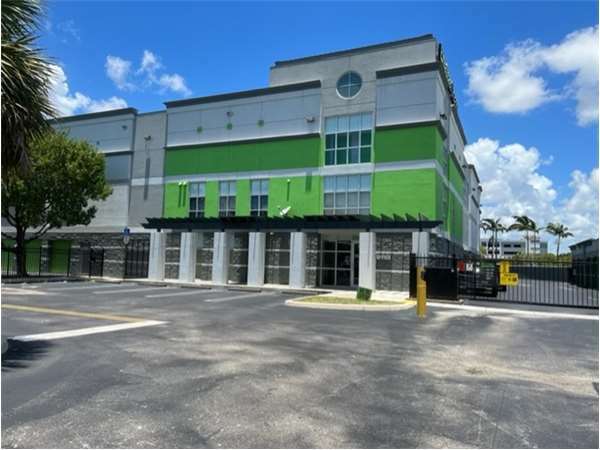 With units as small as 9 square feet and as large as 300 square feet, our Fort Lauderdale storage facility can accommodate practically any storage need. Unit features include indoor access, first-floor access, elevator access, drive-up access, climate control, and outdoor vehicle storage. If you have temperature-sensitive items to store, climate control is a great amenity for you. Climate-controlled storage keeps your unit between 55 and 80°, protecting belongings from extreme heat and humidity year-round. These units are available in sizes 3x3 to 15x20. Need to store a vehicle in Fort Lauderdale? Extra Space Storage offers 10x15 to 10x30 drive-up units and 8x17 outdoor parking spaces that can handle vehicles from small motorcycles to large motorhomes. At our S. State Rd. 7 storage facility, we go above and beyond to ensure you and your belongings are safe. This location utilizes an on-site resident manager, 24-hour video surveillance, individually-alarmed units, and electronic gate access with personalized entry codes to maintain a secure environment. At Extra Space Storage, we pride ourselves on great customer service. Our highly-trained, friendly staff members are dedicated to providing an excellent self storage experience for our customers, and they ensure our facility stays clean, secure, and well-maintained at all times. Contact us today to reserve a storage unit in Fort Lauderdale! Front desk staff are EXTREMELY rude and will hang up the phone on you. Good luck trusting them with your storage unit. Horrible. Was lied to initially when told the rent would remain the same for 1 year. Monthly rent increased $42.32 within 5 months. SCAM. We r very happy with the service, cleanliness and location of the facility and plan to be with them for a while. I highly recommend extra storage. Great experience. Good customer service, clean facility, air conditioned, provided hand carts for use. My husband & I found ourselves needing a storage unit @ 5pm on a Saturday. Extra Storage & another facility are 1/2 mile from where we live. I went to the other facility 1st because it was the closest, but they were closed. I went to Extra Storage & they were open for another 15 minutes. From the moment I walked into the office, I was treated with friendliness & respect and the employees didn't care that they were closing in 15 minutes. They took the time to ask me what my needs were & since I wasn't 100% sure, they showed me 3 units of different sizes & layouts and also explained in detail the costs. At no time did I feel that the employees were in a hurry to leave even though it was after closing time. I will definitely recommend Extra Storage Space to anyone needing a storage unit. Very helpful, very clean, affordable. Easy access to the space We have enjoyed our experience. Always friendly, always had the space I needed and price. The 1st complaint is that when I spoke to the Storage Manager the day I reserved the unit online and rented/moved in the same day, he didn't tell me that I'd have to either bring a lock or buy one from them. It was a very hectic day, and a reminder to bring my own lock would've been nice. The 2nd complaint is that after a few months the price went up. I was told at the time that it was due to increase in costs. After having paid for over a year that increase, I happened to look at their units listed and the rate being offered to new customers. I was quite upset to see that the exact same unit size/location was being offered for far less to new customers than I was paying, as an existing, always paid on time, no trouble causing customer. After I spoke to the Manager, he lowered my rate starting with the payment due. However, I was denied getting reimbursed for all the months I'd paid more than New Customers. It still bothers me that I wasn't even offered a partial refund. The only reason I'm rating this storage 4 stars is that I became a victim of check fraud towards the end of January'17 and my money was not released to me til February 24th, 17! And when I called and explained my situation and why I wouldn't be able to make my monthly payment for February on the 14th, when it was due, I wasn't charged a late fee, and the Manager was very understanding and kind, assuring me that it would be ok, due to the circumstances, and I didn't need to worry about my unit and being charged any late fees. This is a great storage facility. The staff was very helpful. The place was clean and has easy accessibility. I received a good price for the unit. I would definitely recommend them to anyone looking for a storage unit. The staff was very friendly, the units were nicely maintain, location was exactly where we needed it to be. The price was the cheapest compared to other places in the area. ExtraSpace Storage is very clean, professionally run, conveniently located, reasonably priced, and has good hours to access the facility. The move-in process went very smoothly. The employees are extremely helpful in making the entire process go as smoothly as possible. Location is perfect. The area is kept VERY clean. Access is super easy and convenient. Absolutely great storage place. Always clean, good customer service. Do you have extra stuff?. you need that "extra space" that is also secure, and clean (no bugs or rodents) and convienent......THIS is the place!! BTW THE STAFF IS GREAT!! Employees Maria and Jim were very friendly and attentive, and the service I received from them when renting my space was very quick and efficient. And the facility was fully functional extremely clean. I am very impressed by the security at ExtraSpace Storage. It took a while for me to collect my possessions and I want to make sure that the place I keep them will have the same care and security that I have for them. Not to forget the overall cleanliness of the facility. My only complaint is why I did not find you guys sooner. Thanks for everything you do! Keep up the good work. The faculty helped me a lot when it came to finding me a storage place for a good price and also it is a very clean and well-kept facility. I am very impressed with the way EVERY representative take care of customers. They talk always with easy, friendly tone and respect. The information about the facilities is accurate and the prices are excellent. Friendly experienced staff, TOP maintained facility. The convenience is great and it is always nice to walk into a clean establishmenht and know that my belongings are safe and secure. I have to rent these units for work and this location is most definitely the best storage facility I have ever used. The people in the office are always friendly and helpful. The hallways and surrounding areas are always immaculate. I would recommend this particular facility to anyone looking to keep their items safe and secure! The facility is incredibly clean and easy to access. The security features are user friendly. I appreciate the fact that the lights are motion sensitive. It tells me if there are others around. I have no comments about the services I h receive since I am an Extra S customer. Great storage place, would definitely recommend for anyone moving from the South FL area or to someone just looking for some extra storage. Great prices as well for new and existing customers. This is the best storage experience I have ever had. The managment was Great and really helplful. The facility is nice and clean and secure. I have never been treatd so well when renting storage space before. The prices are reasonable too. In the 2 months I 've been with this company, it has lived up to what it has promised. It is easy to navigate the website, the facility is open extended hours so one can have access to one's space at convenient hours. Thanks for all your help. I like this facility because the security is great and it's not too far from where i live, i find it very clean and when i need a cart, i always find one. All the units can be locked with two locks which i also like. I would definitely recomend people to store their things at extra space storage. The unit is very easy to get to and the facility is very clean. My main problem is that I have now received by 2nd raise in rent in less than 8 months being there. Time to look elsewhere. I physically inspected 5 competitor locations, and this was hands down cleanest, most protected and organized. Also most competitive on price, but they didn't win me over because of price. Each staff member is uniformed, the site is Kraizen clean, and service very professional. Guys at the front are very helpful. The facility is brand new with top notch security features. Prices are competitive. Easy access,Secure,Convenient, Clean and reasonably priced. I have recommended your facility to friends and aquaintences,and one has leased to date. NICE CUSTOMER SERVICE, FACILITY AND MANAGER. VERY SECURED PLACE. 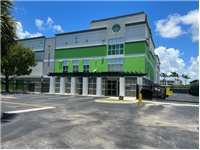 This facility is clean, safe, and secure - and located near 595, SR 84, and I-95. The staff made it easy by going over the security features of the facility, explaining the account details, and answering all of my questions clearly. Definitely would recommend. Great facility! Very Clean and secure. The Staff is very professional and friendly. Would recommend this site to everyone! I am very happy with the facilities from the day one. I would recommend this facilities to anyone. Great services and way above average customers services. Although it's a little more expensive than other places, it's worth it for several reasons. Location is right by all major highways 595, turnpike, i-95, and 441. Also, each unit is equipped with it's own alarm which other places I've used in the past did not have. Staff is friendly and premises are very clean! What a great team....so nice...so helpful. Property is so clean and secure. This is the place you want, if you need storage. At This unit my bike was left by an elevator and taken by another customer and the managers were able to retrieve it 26 days later. So grateful. Thank you. On numerous occasions when attempting to transfer storage from car to unit, I was unable to locate a cart to move the goods. This facility almost always only keeps two carts for this purpose, however, such a large facility needs more carts and some type of control to prevent one large moving truck from using all of the carts at one time leaving everyone else waiting for a cart. Needless to say two carts for a facility with 800+ units is unrealistic. This place is amazing. Every unit has alarms, energy lights, friendliest staff. This is like a hotel for storage. Wonderful experience, will recommend. Great Staff!!!! I was one of the 1st new tenants at this facility, almost 6 months later, still clean, organized and staff still working as hard as day one. Jim and Jon are great. They are working everyday to keep it clean. One day I see them changing lights another they are unit cleaning doors and yet another they are putting up new banners and I think I see them using the floor cleaning machine everyday. I needed a larger unit than what was available, and there it was the next day. They actually converted 2 units into 1 for me. I dont know of any other company or manager that would do something like this. What great customer service and great personalities. I always dreaded going to previous storage facilities because they were very dark and creepy. The first time I saw your facility, I was so impressed with the cleanliness, bright lighting and cool temperatures. I actually look forward to going to our unit now. Everything about the facility is what it should be. It is clean, the individual units are easily accessible down wide corridors, vehicle access is good, trolleys are always available, it is conveniently located just of the 595, and the staff are super helpful. What a clean, pleasant, and secure facility! Jim, and his staff make life very easy. I would highly recommend this location. It was a little out of my way but worth it! It's far superior than any other facility in the area. the facility is always cool and very clean,and in addition to that,its always very very easy to access my unit that I have rented.There is never any undesireable people hanging around the storage area,so that makes me feel safe to enter it whenever I need to. I like the facility. Easy to enter and exit, security codes made easy to remember. Just wish I had more access on week-ends. Wish hours were open later. I enjoy renting here, very clean. This facility has the best manager! He is so helpful and friendly! You can see he takes pride in his work! I was impressed by the level of customer service and professionalism towards me. It gave me the confidence to place my belongings in storage at this facility. It's conveniently located and has a certain sense of cleanliness and organization. I would recommend it to anyone looking for a storage. Everything went very smoothly. Manager knows what he's doing. The facility is new, which I like. The property manager keeps the place neat both inside and outside. He is doing a great job. I went in to pay my monthly bill and it was quite easy. Although the service rep was taking care of another customer, he did his best to multi-task and get me taken care of. The facility is always clean and secure. Everything is monitored. Very happy that I moved to this location, great service and storage. Drive south on S State Rd 7. As you approach SW 20th St and the Shell station, get in the left turn lane. Turn left onto Riverland Rd. Our facility is immediately on your right, easily accessible via the right turn lane. Drive north on S State Road 7. Pass under the Port Everglades Expy. Turn right onto Riverland Rd. Our facility is immediately on your right, accessible via the right turn lane. Drive west on Port Everglades Expy. Pass For Lauderdale-Hollywood International Airport. Stay right and use Exit 8 & 9, merging onto S State Rd 7. Before you reach the Shell station, turn right onto Riverland Rd. Our facility is immediately on your right, accessible via the right turn lane. Drive east on Port Everglades Expy. At the interchange, follow Exits 9 A-B and 8 toward Orlando and Miami. Continue in the right lanes and take Exit 9A toward US-441 North. Merge onto S State Rd 7. Turn right onto Riverland Rd, before the Shell station. Our facility is immediately on your right, accessible via the right turn lane.